Your furniture is important to your family and your life style. It also is important to the looks and comfort of your home. If you think about it, your furniture receives a significant amount of wear and tear. Every time you dust your coffee table or end tables, that same amount of dust has settled on your upholstery. Proper care of your furniture and upholstery can extend the life by several years. Vacuum your furniture regularly just as you do your carpets. Before you put anything on the fabric look for the Cleaning Codes on the tag (tag is usually on a cushion or under the furniture) W: is water based cleaner, S: is solvent only, X: Professional cleaning only, no water. Whatever upholstery cleaner you choose, do not leave any soap residue to attract more dirt. If you allow pets on your furniture make sure you have a pillow or a pad for them to lay on. Do not lay newspaper on your upholstery. The newsprint can transfer to your fabric. 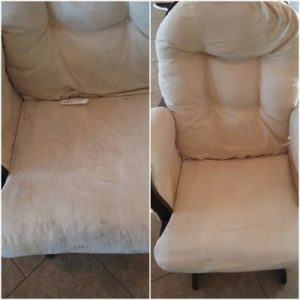 Have your upholstery professionally cleaned on a regular schedule. Deep professional cleaning can extend the life of your furniture. At Crystal Clean Carpets we specialize in low moisture carpet and upholstery cleaning. We can deep clean your fine furniture without soaking it. The fabric in your upholstery is very different than the material in your carpet. You need a professional that knows how to clean the various fabrics and is familiar with the sometimes exotic dyes and prints used in upholstery fabric. We make your upholstery vibrant and fresh. We can then add a fabric protector to keep it repelling soil and stains.